A photographer in Dubai was preparing to shoot New Year's Eve fireworks on the 48th floor of a luxury hotel, when a fire broke out. Dennis Mallari hung outside the balcony for two hours before being rescued - but he continued to snap photos and video of his ordeal. The New Year's Eve fireworks display in Dubai rivals the best in the world. So when photographer Dennis Mallari prepared to shoot the event from the balcony of a luxury hotel, he knew he would get some great shots. That was the plan, anyway. But at 9:30 pm, Mallari noticed a massive fire raging below him. 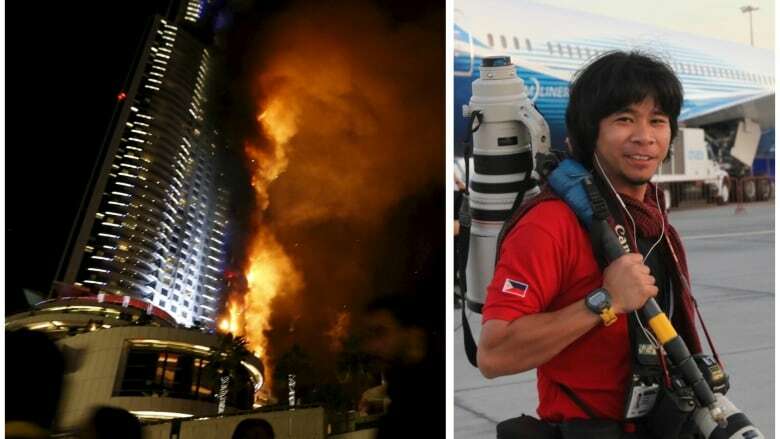 Soon, The Address Hotel was engulfed in flames — and Mallari found himself trapped on the 48th floor. "I saw the smoke, and then my camera was already set up on the wall of the balcony, so I took a couple pictures. And then suddenly the fire was already on the top of the building. It was so very quick," Mallari tells As It Happens guest host Helen Mann. He says the first thing he did was call his wife. And then, he called another photographer on the ground to tell them to alert the fire department that he was trapped. "After I panicked, I tried to focus myself. Every time the wind changed directions, it went into that balcony. Everytime the smoke went there, I hung my head outside just to get some fresh air," he says. Eventually, Mallari found a cable attached to a window-cleaning device. He tied it to his belt, with his camera equipment around his waist, and lowered himself off the balcony. Then, he spotted something he could rest his feet on. "There were lights on the side of the building. They're quite big — the size of a basketball. I stood there for about an hour, with the help of the cable. But [these cables] are not designed for rappelling." Mallari leaned against the building, waiting for help. But he also did something else: he took out his camera, and began to shoot what he saw around him. "For me, it's like... when I have a camera, I don't have fear. [I should say] I also have a fear of heights. But in that situation, I had to face everything. "The only thing I could do was contact somebody and wait to be rescued." The rescue was difficult. Mallari was hanging off a balcony that is only used by maintenance crews, so initially the fire fighting crews skipped over it. But as Mallari continued to bang on the building and shine his head lamp, a firefighter pulled him into the building, and away to safety. "His name was Hassan. I found his name yesterday because I went back to give big thanks to these people. He's my guardian angel, that man."